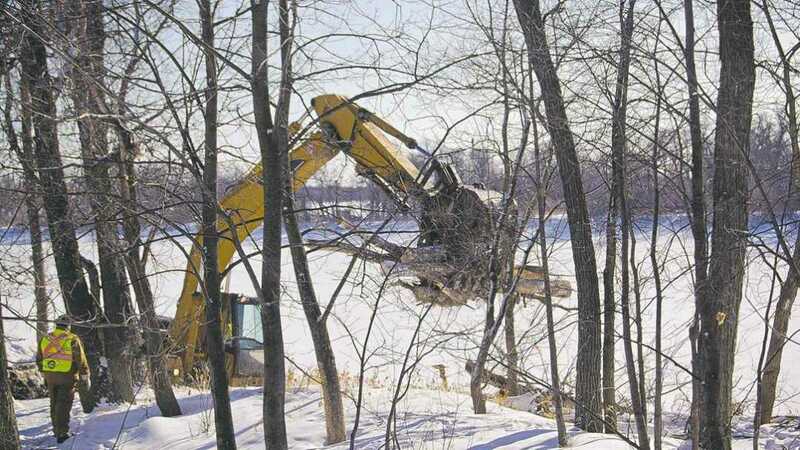 The City of Winnipeg is currently undertaking Phase II of an erosion protection project in King’s Park. This work will occur from January to March, 2016, with planting and re-vegetation work to be completed by mid-July, 2016. Trucks and equipment will be entering and exiting the park. Pathways along the south-west side of the park will be closed for the duration of the winter work, and the work area will be clearly marked with fencing and signage. Alternative walking paths will be plowed around the work area park to maintain a contiguous walking loop for the public. Vehicle access to both parking areas will be maintained, though a portion of the south parking lot may be fenced off. This $1.5 million project will address the aggressive riverbank erosion occurring along the project area, and enhance public safety. In the past 15 years of monitoring the riverbank, about 1 acre of land has been lost to erosion and led to deep-seated bank instabilities that have impacted the uplands area. This project was initiated in 2015, and Phase 1 (600 m) was completed in Winter, 2015. Approximately 250 m remain for 2016. Re-grading in the mid-bank area to achieve improvements to bank stability, while minimizing impact to existing natural areas. Restoration of other areas impacted by construction activities. For more information regarding this project, contact Winnipeg’s 311 service by E-Mailing 311@winnipeg.ca or phone 311.